Go Mad or Stop Caring: AFC Wimbledon - don't believe the hype? AFC Wimbledon - don't believe the hype? Among posts relating to the rumoured departures of Will Hoskins (to Brighton) and Chris Lines (Crystal Palace for a six-figure fee) - and the expected appointment of Paul Buckle as the next manager (regardless of whether he leads Torquay United to promotion via the League Two play-offs, which is a bit strange) - the Bristol Rovers Alternative Forum has been awash recently with congratulatory comments re. 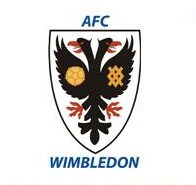 AFC Wimbledon's promotion to the Football League. You can imagine the type of things written, I'm sure. The thing is, I can't help associating Kingsmeadow (AFC Wimbledon's stadium, where Rovers will visit next season) with Kingstonian FC. Did AFC Wimbledon buy the ground weeks before a Kingstonian Supporters Trust were about to? Would Kingstonian FC not be in existence if AFC hadn't bought Kingsmeadow and allowed the K's to play there on a nominal rent? Will AFC Wimbledon ever move back to the Borough of Merton and give Kingsmeadow to Kingstonian FC, as is apparently planned? I don't know. I'd like to, though, and will undertake some further reading. It would be nice if others were to do the same, rather than simply adhere to the “AFC Wimbledon good, MK Dons bad” mantra (I've no problem with people disliking MK Dons, but surely others such as the FA and Sam Hammam deserve as much, if not more, condemnation for facilitating the move?). 3,039 people saw Wimbledon's game with Everton at Selhurst Park in the Premier League on 26th January 1993. Three thousand people! (To put that into perspective, 4,358 were at Kingsmeadow for their thumping 6-1 win over Fleetwood Town in the Conference play-offs earlier this month). Wimbledon averaged 6,961 during the final season before relocation was confirmed. I may be wrong and/or out of line here (hopefully the aforementioned further reading will clarify), but if more people had been bothered about the self-styled Crazy Gang when they were struggling (when already in the Football League), then perhaps the club wouldn't have been moved to Milton Keynes in the first place? Agree about the over-simplistic view about MKD bad, AFCW good, but suggest that the lack of numbers at home was caused by boycotts against the owners at the time. However, my personal AFCW beef is how much they give it the 'big one' when bullying smaller non league clubs, when I can recall what a joke they were as a top flight club, size-wise. Point taken re boycotts possibly affecting the attendances; Wiki would indicate that average crowds peaked at 18,235 in 1998/99. What happens if AFCW achieve another promotion, though? Is Kingsmeadow good enough for League One? How long before the full circle is complete, with AFCW back at Selhurst Park?! "A game in Milton Keynes between a club that used to play in Croydon and one from Kingston-on-Thames that are called Wimbledon"